For the up and coming trail rider, we present the Diamondback Sync’r 24. A smaller wheeled version of our hard charging hardtail, it’s a completely capable kids mountain bike ready for action. 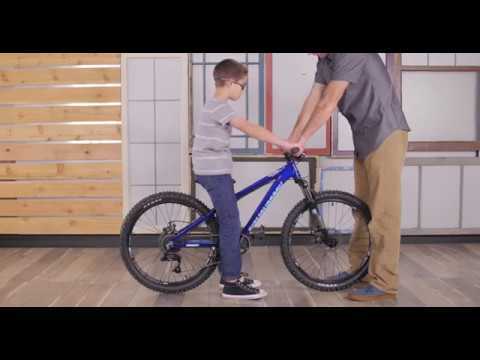 The 24 inch wheels and low slung geometry provide just the right fit and handling for young riders, and it’s built from the same material we use to make our full size mountain bikes. Stout DB double wall wheels are built to take abuse, while the grippy 2.35 inch wide Kenda tires provide plenty of traction and stability. With comparable components to what you’ll find on the big guys’ (and gals’) bikes, young riders will have all they need to get to that next level with the Sync’r 24. Boys/24" / Age: 8-12 Rider Height: 54"-62"
This is a TON of bike! We got this as a birthday present for my 8 year-old. Needless to say, he loves it. It rolls great, shifts great, brakes great. It’s great! This is by far the best bang for the buck of any bike I found. Did I mention the bike is great? Great value and Ready to Ride assembly! We ordered this bike for my 10 year old who is already a strong single track rider but was being weighed down by his current 20" bike. We are reluctant to get a full-suspension due to the weight hit (and since a hardtail will teach a kid better technique!). The components/set-up on the Sync'r are great for the price. The bike arrived FAST and was packaged well. Loved the free shipping and best of all READY to RIDE assembly. Putting the final pieces together was snap for my bike-riding spouse - the kid was on it the next day, and once he'd mastered the shifters (former bike had grip shifts), he was tearing up the trail. Very pleased with our purchase! While it's not been ridden yet, I have to say that assembly was a breeze. The packaging was solid, delivery time quick (3 business days, free, FedEx), and the customer service was on point. Make sure to have bike grease already on hand, and it came with the allen wrenches & pedal wrench. The videos (link comes with bike) were straightforward. It took a little tightening of the front wheel lock to seat the disk brake in the pads. I freaked out a bit when I heard some noise when i first turned the cranks, but a run through of the gears rectified all fears and she's humming now. Impressive bike/components. The dad in me was happy to see it come with reflectors in the normal places (not shown in the pic). Additionally, mine was missing the two front cable clips which kept the cables attached to the frame; I contacted customer service and they have them on their way to me same business day. Nice work DB! Hope to add to this review after my son gets some dirt on it. Free shipping & no tax FTW! After looking for 6 months for a 24" MTB , we finally found the Diamondback Sync-r 24". Though it's a hardtail the style and quality of components are hard to beat. Not to mention the affordable price. In my opinion this is the best bang for your buck , knowing your child will out grow within 2-3 yrs. A full suspension will be the next purchase but I'll have 2-3 yrs to save for the one we want. It's hard to find a 1x11 24" mountain bike for kids that is less than $1000. The components on this bike are really nice. The packaging for shipping was excellent. With free shipping and no tax, you will not find a better deal with this level of components!